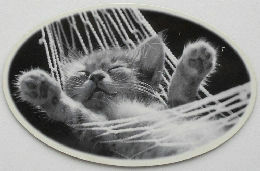 This is a photograph of a kitten that has fallen asleep in a hammock. The magnet is 4 3/4" wide x 3" high. Previously owned but in good condition.